For the STAGO - Stapling machines functionality, precision and a high ease of use are always in the foreground. Robust mechanics, durability of materials and modern urges are the warranties for a perfectly long-running function. 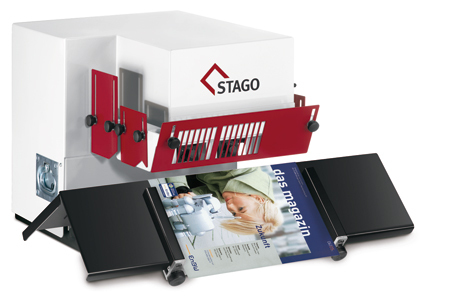 STAGO- Stapling machines are equipped with electrically secured protection with a visual display (only automatic machines) and a depot display. Contact us! The HM 15 and HM 15/2 are the staple professionals among the STAGO staplers. They combine versatility, efficiency, and robustness. Designed for professional continuous use. With a stapling capacity of up to 17 mm with one or twin stapling heads, they are the reference for the bench models. Using a few simple hand movements, the support table can be converted between a flat and saddle stapler. Staple front loading and a large staple cartridge allows for efficient operation even for small runs. With the fully automatic stapling force adjustment and the active clenchers, perfect stapling results are a breeze. The ability to process additional staple loops complete our range of bestsellers. For longer runs, the HM 15/2 model with twin stapling heads and a fixed staple clearance of 80 mm (folder dimension) is suitable. Perfect for booklet making with loop staples in one working step. Supplies for Stapling Machines STAGO original equipment made in Germany Delivery of replacements just in time We deliver original replacements just in time!